My kids loves to go to this place where there are hundreds of flamingos (few minutes off the road between home and work...). 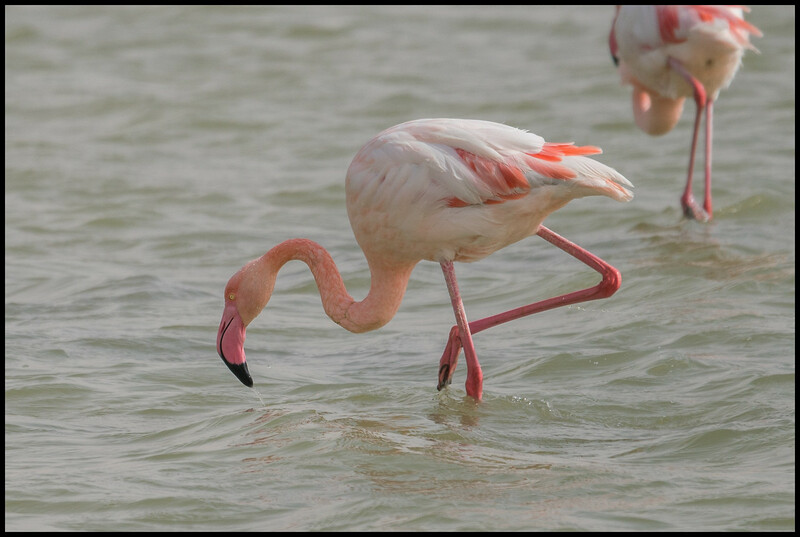 Last week (October 30) we went there and I saw a somewhat different flamingo. 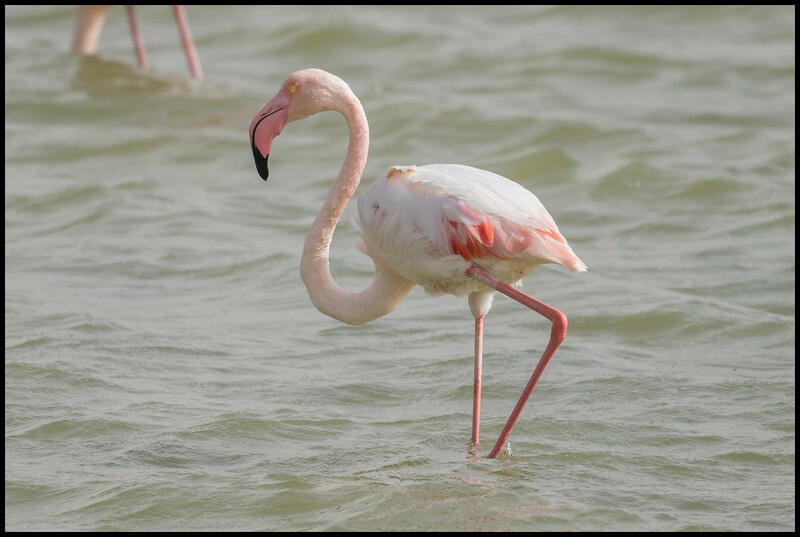 Few days later, the local media was excited about a rare black flamingo who visits here (for Google translated media coverage see here). 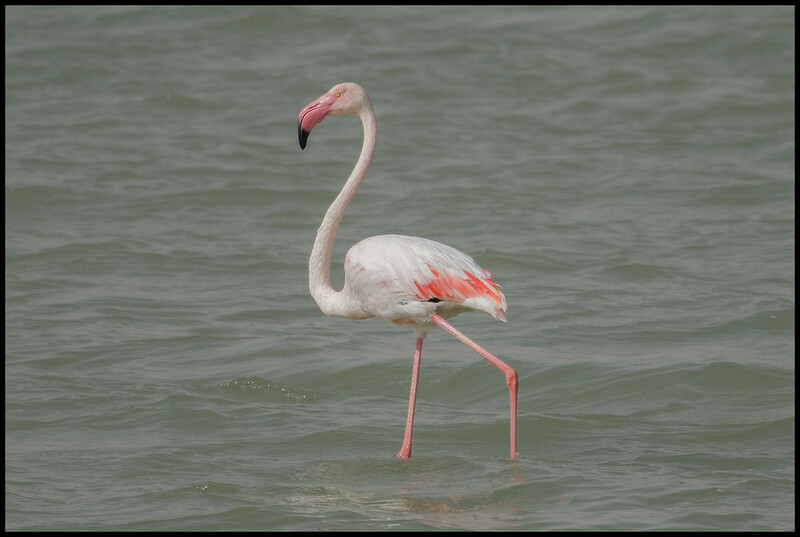 Shortly, a black flamingo was observed here 8 years ago, and after 2 years it disappeared, but then reported to be seen in Cyprus. Now it seems to be back, and it is believed to be the same individual. Another somewhat unusual view was the flamingo who was standing in a funny position, outside the water, for the entire time I was there (around 45 minutes). I think it is injured. Based on pictures in news articles (eg. 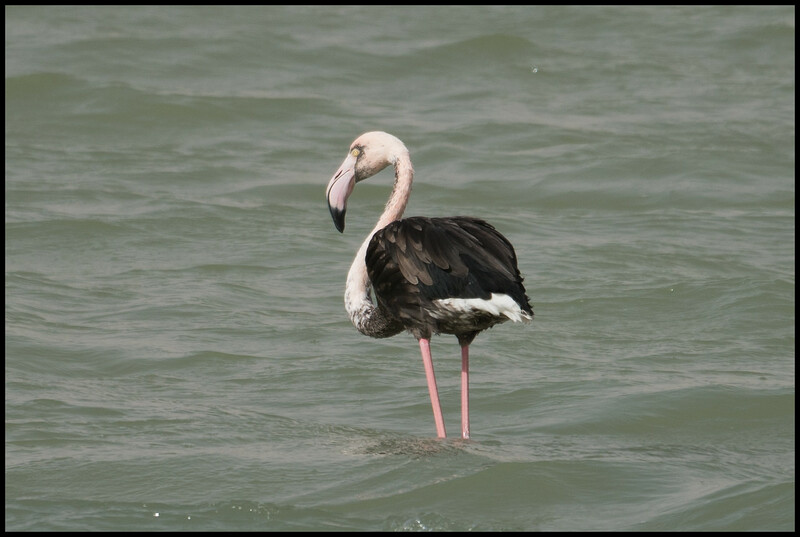 https://cyprus-mail.com/2018/02/28/rare-black-flamingo-returns-base/), the bird seen in Cyprus has had even more black colour than the individual shown in your picture. Of course, it might be still possible that it is the same bird, which has been moulting and thus the plumage has changed. Very cool, great that through photography we get to vicariously experience all these things with each other. That is one strange bird - and I like him! Very cool coloring, and nicely photographed (would have been nicer if he'd have turned around for you). At least here in the States anything that stands out like that is going to draw a crowd, so I suspect it's the same bird. 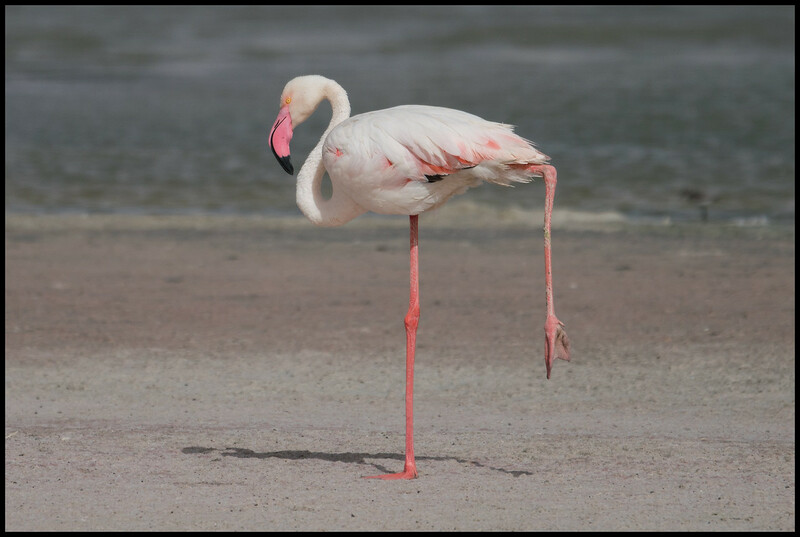 Like the other flamingoes too. #2 is a very special image! 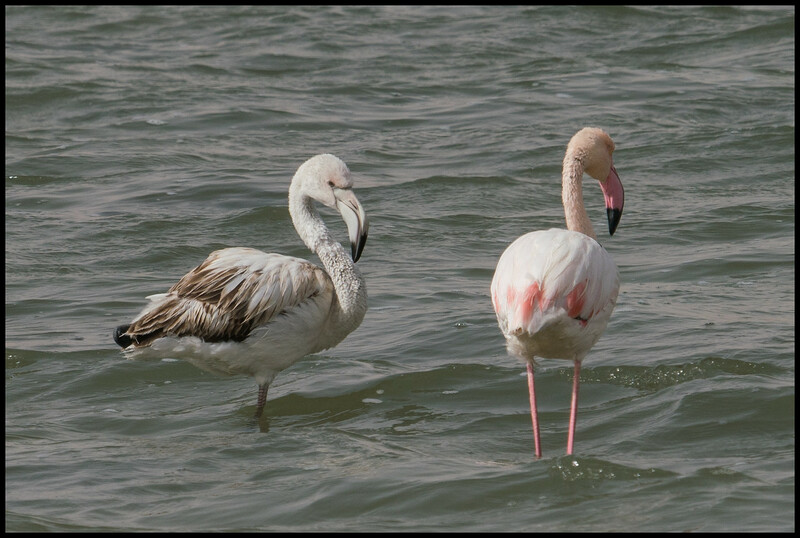 I immediately feel some compassion with that bird, the second "irregular" flamingos! A great catch, Shay! 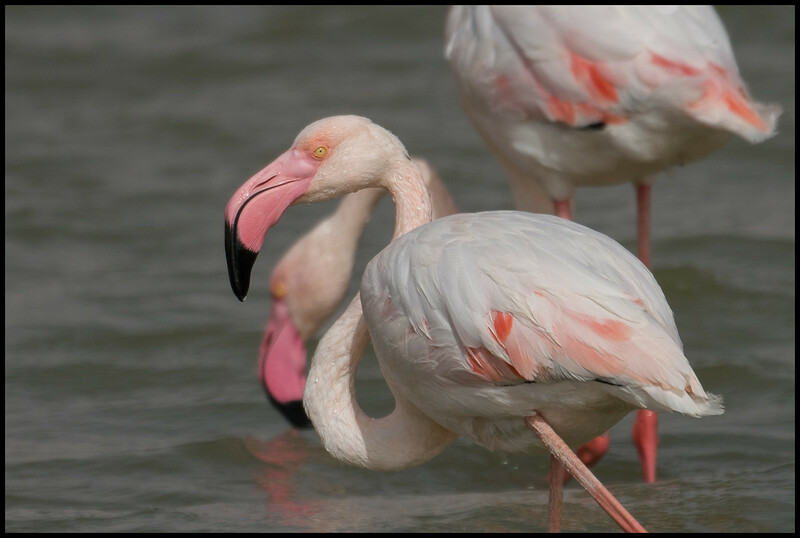 But let's face it: Even the "regular" flamingos are quite strange birds (the longer I look at them the stranger)! Fred, here is another reason for you to visit here... (BTW, on my computer there is no problem with the link, so I am not sure what is wrong). Hezu, indeed the one which was observed here eight years ago and later in Cyprus was all black (which is much more impressing and unique! ), but the head of the local birds observatory says that he believes it is the same individual which has been moulting as you suggested. Roy, apparently flamingos are shy - whenever I try to get a little closer they turn around and walk away before I get within the reach of 400mm lens... If I try to get closer quickly, they just fly away. I was there before the media coverage, so it was still unpublished. Further more, this specific spot where you typically see hundreds of flamingos and where they are nesting is somewhat a "secret" spot. There are no signs and only if someone told you about it you would know it. ~2 km south there is an official observatory, where typically you can see some flamingos, and this is where the "crowd" goes. Although it is also not a crowded place... Generally the crowded birding spots are in the north and not here in the south (although the professional birders like the south more...). But than I should bring the whole family, or would the be happy with jusy my pictures? Lovely set, I've never seen a Black Flamingo before. Tfs. Very nice photos and a really interesting bird - as you say it really stands out in the pano.